What is the Laura Mercier Illuminating Tinted Moisturizer? Why is the tinted moisturizer by Laura Mercier so special? How to get the best out of the tinted moisturizer? Trying to have an efficient and easy skin care routine for your black skin is quite a challenge. You need to moisturize, protect against the bad UVs and apply makeup. And these are just a few of the steps you have to take. Wouldn’t it be great to use a cosmetic product that does at least three of these things? 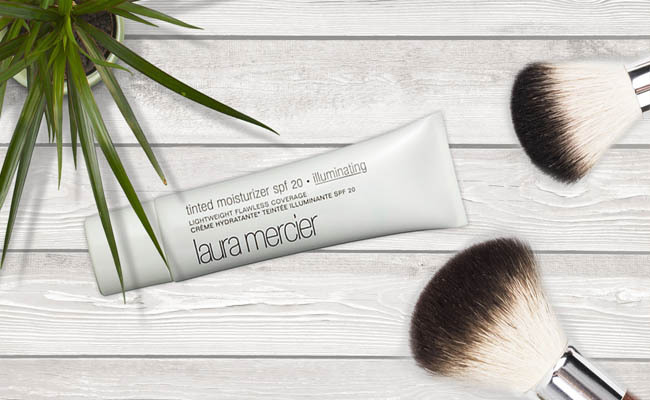 The Illuminating Tinted Moisturizer SPF20 Natural Radiance by Laura Mercier is a moisturizer that has a subtle shimmering color. It’s a lightweight foundation that is easy to build on, leaving a nice and healthy glow on your skin. As if this wasn’t enough, the tinted moisturizer has an SPF20 so it also protects the skin from the damaging UVA and UVB rays. This lightweight moisturizer is a nice buildable foundation that also protects your skin from the sun’s bad UVs. It has a subtle and nice glow, leaving a natural satin finish on your skin. The moisturizer has a skin-friendly formula that addresses all skin types, bringing amazing benefits to the dry skin. It’s a safe choice for anyone fighting Rosacea and it’s not too shiny on skin. The formula is based on the one-of-a-kind Dewy Complex that moisturizes the skin, but also protects it from the exterior aggressors and irritants. Due to its lightweight consistency, the moisturizer is easy to layer with various foundations for giving you the best shade and the nice radiant finish. The moisturizer is dermatological tested and doesn’t give irritations. It’s a great option for the dry, flaky and acne-prone skin. The formula of the moisturizer includes several ingredients that stay behind its efficiency, and some stand out with their benefits for the skin. Castor oil-it’s anti-aging and minimizes acne. It fades out blemishes and diminishes the appearance of stretch marks. It reduces pigmentation and moisturizes the skin. Hydrogenated olive oil-is a great skin cell regenerator that seals in the moisture of skin. It allows sweat and sheds the dead skin cells. It leaves the skin firmer, smoother and nourished. It’s an anti-aging ingredients that also hydrates the skin. In order to get better and nicer results, it’s important to follow some steps when using the moisturizer. Begin by cleansing your skin. Apply it on your clean skin, rubbing with your fingertips smoothly, with a nice downward motion. You can get the nice radiance by setting it with a velour puff. You can also go for a matte finish, in which case a foundation powder applied with a powder brush is going to do the trick. The moisturizer lasts all day and doesn’t weigh down your skin. It doesn’t build up and doesn’t highlight the lines on skin. It doesn’t leave an oily feel on skin and covers pretty well. It’s good enough to cover freckles or blemishes. The tube packaging is hygienic and clean cut. When you’re trying to clean your face, it’s better to remove it with a cleansing oil. The tinted moisturizer from Laura Mercier doesn’t just give your skin a nice and natural glow. It also hydrates, moisturizes and protects your skin from sun’s UVs. Additionally, it blends nice with other cosmetic products and gets you through the whole day. As for the price, one could see it with a cold-eyed. But, then again, isn’t your skin final look worth it? Here are more products that we have reviewed in full: the Chantecaille Blanc Gardenia Brightening Essence, the Lifeline Daily Defense Complex Solution,the 20% CE + Ferulic Serum by Nieuw Beauty, the Annemarie Facial Cleanser, or the Active Pigment and Lifting Cream by Tulip Natural.